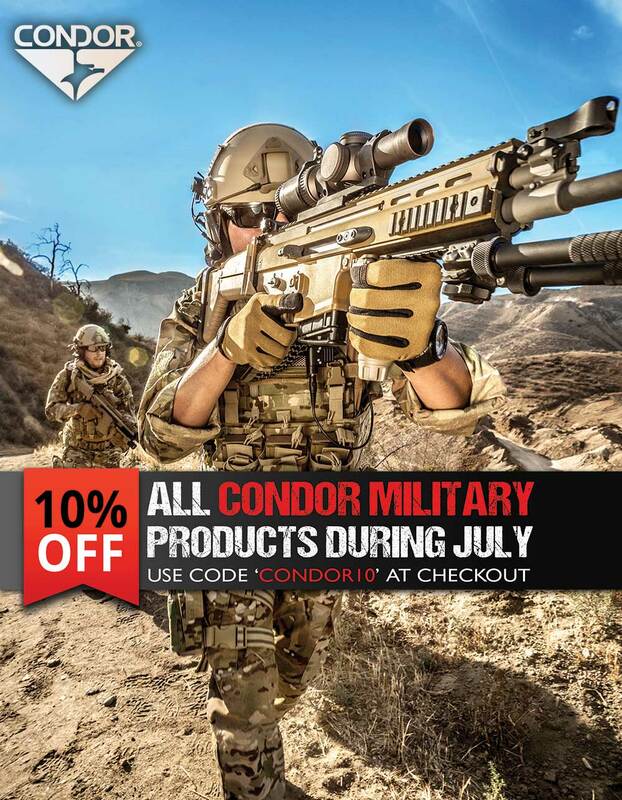 We have teamed up with Condor Military Products to bring you great tactical gear at the best price. In this post you can find some of our top military clothes and gadgets made by Condor. At the checkout simply enter CONDOR10 to claim your 10% off! This latest gen battle belt has been re-designed with a modern body contouring shape and is half the width of the standard battle belt. Condor’s Gen 2 belt is compatible with either the H-harness (or other suitable yoke) and a roll pin, webbing or Rigger’s belt. This belt offers lightly padded mesh ventilation plus lined non-slip strips for added comfort. It also features velcro side panels for simple belt threading, drop leg holster attachments, two rows of MOLLE/PALS webbing across the belt, four D-rings for harness and two leg-mounted holster/dump pouch attachment openings. Made with durable Multicam Cordura fabric, this 10 inch case features MOLLE/PALS webbing links on the rear side allowing you to attach it to your patrol pack or luggage. Constructed to fit 10inch technology such as tablets, laptops and the like this carrier features a main velcro flap closure, additional zipper pocket for business cards, ID or other accessories, padded construction with neoprene lining and double D-ring on the rear. The inlay of these military-grade knee pads feature 1/2 inch of high density foam for great protection of the knee. It’s non-slip rubber finish and dual velcro fastener straps mean these pads will stay firmly on your knees. Sold as a pair. 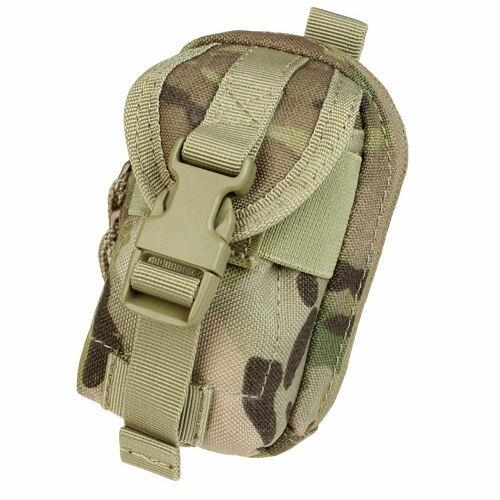 The H-Harness is a lightweight, low profile MOLLE/PALS compatible Yoke. Carry all your essential gear and increase your movement speed at the same time. The H-Harness is meant to be used in conjunction with our Tactical Battle belt and Rigger Belt, providing the ultimate platform for mobility. Offering contoured shoulder pads with a MOLLE/PALS webbed section on the rear panel and lightly padded mesh for comfort and ventilation. Plus four adjustable straps connect to the battle belt and a quick release, adjustable buckle secure the Harness at the front. Each shoulder has a D-Ring and multiple rows of webbing for attachment of equipment such as grenades, tactical flashlights and radios. Made to fit most hydration tubes on the market including those with neoprene sleeves by CamelBak, Source, Highlander, Mil-Tec and Web-tex. Manufactured with genuine Crye Precision MultiCam fabric. Created with stretchable polyester micro-fibre this Crye-Presicion MultiCam wrap will keep you comfortable in a number of different climits. Offering anti-static and moisture wicking properties that will keep moisture off your face. It can be used in a number of different ways from balaclava, to thermal hat to bandanna and more. Carry all your small items such as keys and coins in this awesome grenade pouch. Made with durbale zip access and a top circular carabiner for attaching to belt, bergen or rucksack. When opened you reveal 5 key clip holders, a small mesh pocket and a zipped coin pocket. Makes an ideal gift. Mostly used by special forces and contractors this Condor cap omits front panel making it suitable for machine embroidery for teams and units. Also featuring two velcro patches – one small top patch (for IR squares etc), and one medium back patch (for name tape/identification etc). Is made from genuine Multicam ripstop nyco fabric (50% cotton, 50% polyester) and comes with adjustable back strap. The most effective way to carry one or two standard 5.56mm mags. Designed for the battlefield, this Single Stacker Magazine Holder is constructed from tough Multicam 1000D fabric. Incorporates easy access open-top design with tough elasticated bungee cords that hold the mags in place and eliminate rattle and movement. MOLLE/PALS fittings attach to all known issue carriage systems including Opsrey. Incorporate into your own webbing system or bergan. Made using a tough headwearing plastic. Features durable carry handle, easy to grip screw top cap which is easy to fill and clean, large bite valve with lid, practical flow shut-off switch and hanger slots for mounting and drying. PVC hose has a soft insulation sleeve and is 107cm in length. Made with genuine Multicam Cordura fabric this Condor flashlight pouch fits all makes of torches like Maglites and SureFire. 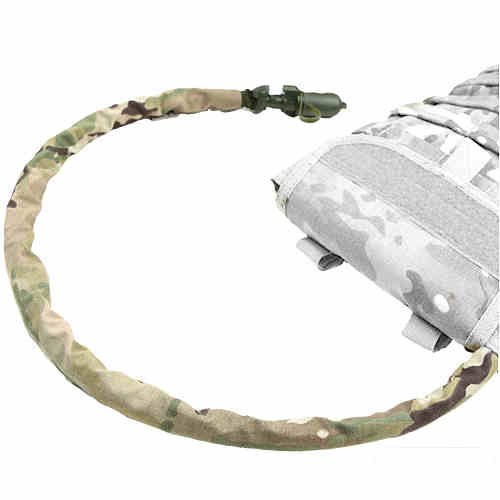 Offers fully adjustable velcro retainer strap, cloth over grommet and MOLLE/PALS webbing or worn as normal belt loop. 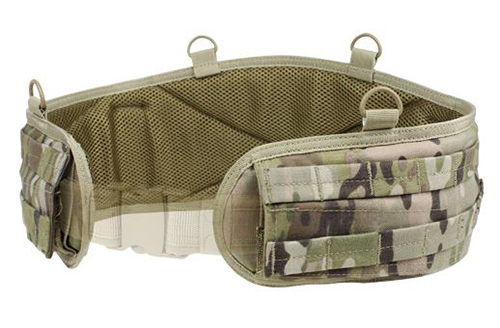 Constructed from strong Multicam Cordura fabric this pouch is ideal for leaders and commanders at all levels. Made with a durable zipper, offers adjustable cord restraints, multiple internal pockets, elasticated loops and an external pocket. Also included is a panel for storing your ID plus fittings compatible with all known MOLLE/PALS systems. In an emergency allow others to easily identify your blood group. Features a quick release metal snaphook plus a velcro belt/webbing nylon attachment strap. Made from tough Multicam 1000D fabric. Perfect for carrying your mobile phone, I-phone or other gadgets and keeping them protected form impacts and the elements. Offers twin zipped compartments, belt loop and front pocket with velcro and QR buckle. MOLLE/PALS attachments are compatible with all known issue carriage equipment including Osprey. At the checkout simply enter CONDOR10 to claim your 10% off!